JK Rowling signs on to be the screenwriter for Fantastic Beasts and Where to Find Them. 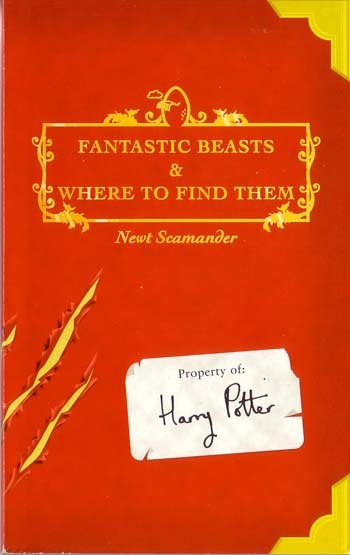 Fantastic Beasts and Where to Find Them was originally just a fictional textbook set inside the Harry Potter universe for first-year students at Hogwarts to read. JK Rowling made the fictional book a reality in 2001, and today she announced she will make her screenwriting debut with a movie adaptation, the first in a series of spinoff films. Warner Bros. plans to develop Fantastic Beasts for "videogame, consumer products and digital initiatives businesses, including enhanced links with Pottermore.com, Rowling's digital online experience built around the Harry Potter series," the press release states. The movie will focus on the life of Newt Scamander, the author of Fantastic Beasts and Where to Find Them in the Harry Potter universe. The film will also take place in New York 70 years before Harry Potter and the Philosopher's Stone. Rowling does not intend for it to be a prequel or a sequel but as "an extension of the wizarding world," she said. Knowing how popular the franchise has been for Warner Bros., it's not surprising that it will continue on even without Harry. Rowling said Warner Bros. approached her with the suggestion of adapting the spinoff book into a film. "I thought it was a fun idea, but the idea of seeing Newt Scamander, the supposed author of Fantastic Beasts, realized by another author was difficult. Having lived for so long in my fictional universe, I feel very protective of it, and I already know a lot about Newt." Electronic Arts published the videogames for each of the Harry Potter films. The press release does not clarify whether the games for Fantastic Beasts would be made by Warner Bros. Interactive Entertainment.